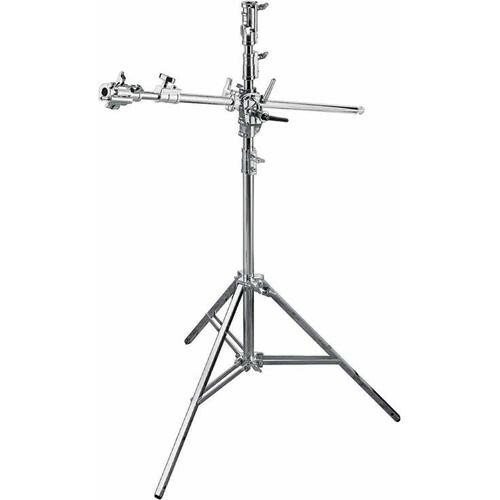 Built by Avenger, this heavy duty chrome-plated steel boom stand can be used traditionally as a light stand or converted to a boom via a pivot in the first riser. The steel boom stand comprises 3 risers and 4 sections and measures 1.65m when closed. It has a 1.35m footprint and like many of our other stands, a levelling leg for stability on rough surfaces. Quick bit of maths please: required Please check your adding up. Total of 3 + 6 please. Quick bit of maths please: required Please check your adding up. Total of 1 + 2 please. thanks for forwarding on information about the Steel Boom Stand.